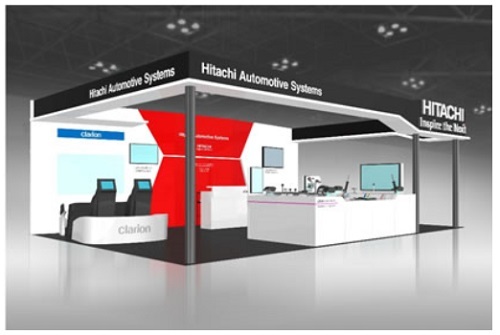 TOKYO, May 17, 2017 - (JCN Newswire) - Hitachi Automotive Systems, Ltd. announced today that it will exhibit at the Automotive Engineering Exposition 2017 Yokohama. The exposition will be held from May 24 to 26 at the Pacifico Yokohama in Japan, under the sponsorship of the Society of Automotive Engineers of Japan. Hitachi Automotive Systems will showcase a wide range of technologies and products related to Advanced Driver Assistance Systems (ADAS) and Automated Driving (AD) systems, which will contribute to the realization of next generation automobiles utilizing the technologies of autonomous driving and electrification. Hitachi Automotive Systems aims to enhance the value of autonomous vehicles through the realization of four concepts: "Safety" - to minimize collisions and avoid accidents, "Comfort" - to realize comfortable riding and stress-free driving, "Eco" - to achieve lower emissions and reduce environmental impacts, and "Time" - to arrive at the destination more quickly and efficiently. At the Automotive Engineering Exposition 2017 Yokohama, Hitachi Automotive Systems will introduce our advanced technologies to realize future autonomous driving applications. The technologies include Traffic Jam Assist (TJA), an ADAS that is a low-speed adaptive cruise control function with the ability to keep track of the vehicle ahead during congested highway conditions, and a Remote Parking System jointly developed with Clarion Co., Ltd. that utilizes a smartphone to enable parking from outside of the vehicle. Introducing electric power technology such as motors that will support the evolution of electric vehicles to realize Zero Emission Vehicles (ZEV) that emit no exhaust gas while driving. 360 degrees sensing technology utilizing cameras and radars to achieve autonomous driving, and integrated vehicle control systems such as safety control technology. Accompanied by video, visitors can experience these technologies scaled to the size of an actual vehicle. Showcasing high-efficiency engine management systems including combustion control systems and heat and energy management systems that contribute to improvements in fuel efficiency. As an example of Human Machine Interface (HMI) technologies, we will feature a cabin-type mock-up to demonstrate Clarion's "Smart Cockpit" that provides driving information to the driver using audio and vibrations, and enables safer and more comfortable autonomous driving.